Kennedy Space Center, Fla. -- A SpaceX Falcon 9 rocket thundered off the pad at Kennedy Space Center's 39A at 9:38 a.m. EST (14:38 GMT). This marked the first flight from KSC's 39A since July 8, 2011. Congratulations to SpaceX and especially to the people that worked countless hours on this historic pad. Very smooth launch and landing by SpaceX. Beautiful to see pad 39A in use again, this time as a leased pad by a private company. The smoothness of the landing process, and superb video all the way to the ground, really belie the complexity of the engineering accomplishment of what SpaceX have done over the past five years of this iterative and incremental development program. Simply awesome! Moreover, beyond the accomplishments of the engineering team, there is the entrepreneurial vision and execution of Elon Musk himself. When studying entrepreneurial theory, the business schools of the world need not look any further than this project for a perfect example that ticks every box. Congratulations SpaceX! Awesome first launch from KSC, and a spectacular first daylight landing at CCAFS! Hadn't seen this posted previously. Here's the NASA "SpaceX CRS-10 Mission Overview." Congratulations to NASA for another successful delivery to orbit. And congratulations to me! Not only did I see the (ten seconds each of) launch and landing, and hear and feel both, and talk to Buzz, but I now have more hardware in orbit! Such a good day! The de-orbit burn apparently occurred on the 1st orbit, at approximately 15:10 UTC, according to the timings of the numerous sightings mentioned in the article (local evening twilight). I didn't see the Notices to Airmen or Mariners re-posted on the NSF forum for the 2nd stage re-entry (but I could have missed them). The article puts this location in the Indian Ocean, southwest of Australia. This was from Raul's hazard map. 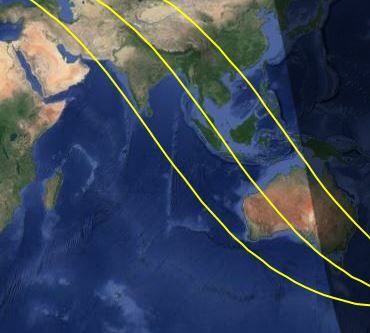 If you zoom out far enough to see Australia, you'll see the re-entry hazard zone for the upper stage. I have seen no information on the accuracy of the actual reentry. This was just the planned area. F9-032 CRS-10 Launch Hazard Areas Map (Local Notice To Mariners) for February 18th, alternatively 19th. A. 28-25N 080-36W, 28-39N 080-39W, 29-27N 079-48W, 31-12N 077-56W, 34-06N 074-00W, 34-04N 073-59W, 30-57N 077-36W, 28-34N 080-15W, 28-29N 080-22W. B. 29-59N 078-51W, 30-04N 078-55W, 30-42N 078-18W, 31-08N 077-59W, 31-42N 077-10W, 32-01N 076-38W, 31-56N 076-33W, 31-09N 077-22W, 30-32N 078-07W. 2. CANCEL THIS MSG 191634Z FEB 17. 26-09S 100-02E, 25-25S 101-19E, 39-12S 115-00E, 49-08S 129-43E, 56-18S 148-28E, 60-04S 170-48E, 61-43S 170-54E, 61-38S 158-07E, 58-47S 141-29E, 52-54S 126-19E, 44-49S 114-05E, 35-09S 105-10E. 2. CANCEL THIS MSG 191647Z FEB 17. Check out the launch of @SpaceX CRS-10 in delicious UHD! Mmm, resolution! It looks so bizarre when it comes in for landing. This must be what early flight seemed like to people at the time. It'll become natural over time I guess.